The Python Turtle module is an excellent introduction to programming. This bundle covers program planning, debugging, multiple functions, syntax errors, co-ordinate math, for loops, tracing, as well as the write function within the Turtle module. 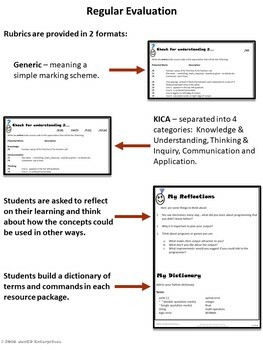 Everything is included: 3 versions of the student handouts, eight PowerPoint lessons, answer keys, tests and 3 versions of the assessments. Concepts & skills have been broken down into short chunks. 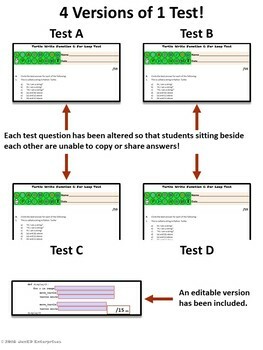 Students are given short code fragments to explore, followed by questions to consolidate their learning. Four assessments have been provided at appropriate intervals. They are also asked to reflect on their learning and provided terminology to begin a programming dictionary. 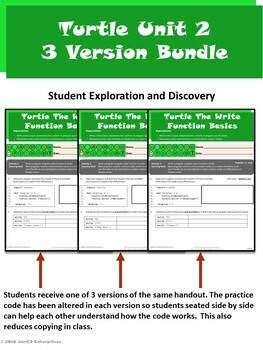 The unit bundle ends with a culminating activity followed by a write function & for loop test so students can demonstrate their mastery of the concepts and materials presented in this unit bundle. Duration: Nineteen 75 minute periods. This unit bundle requires NO PREP! The student handouts will require photocopying but that is all! 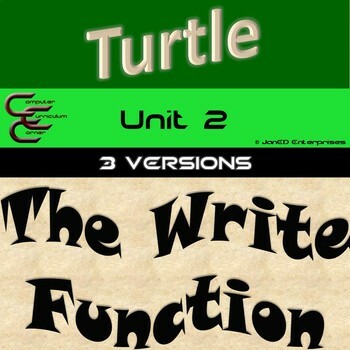 Python Turtle Unit 2 The Write Function and For Loops 3 Versions by Janice Dyke is licensed under a Creative Commons Attribution-NonCommercial-NoDerivatives 4.0 International License.